Canals instead of streets and boats instead of buses. 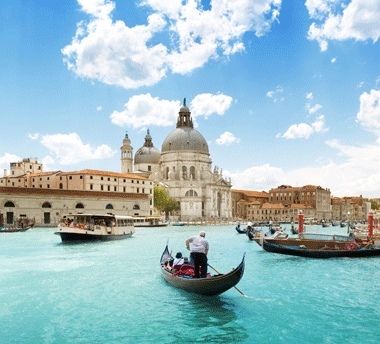 There are few cities in the world that evoke such feelings of wonder and amazement as Venice. Built on 100 islands with over 150 canals and 400 bridges, this city really is one of a kind. Not only does the city shimmer with the water, it is also steeped in history and possesses some of the world’s finest works of art. With palaces, churches, galleries and architectural splendour in abundance, Venice is a treasure trove waiting for you to delve in. With canals instead of streets and boats instead of buses, this unique city is a ‘must-see’. 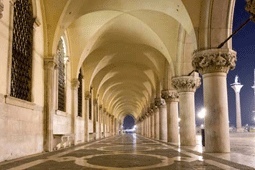 There are six districts that make up the city, with San Marco containing the main sites. The bohemian-chic Dorsoduro, to the south, is crammed with hidden treasures while Cannaregio, in the north, is also well worth a visit. While all this magic goes on around you, remember that daily life goes on in this city too – commuters wait for water-buses, dustmen collect rubbish in refuse boats and deliveries get sent to the markets. Venice – wake up in a city that never stops dreaming. As you might expect, dining in Venice can be expensive. That said, you can move off the beaten track to find some great eateries. Osteria da Fiore, San Polo 2202, Calle del Scaleter, Venice. If money is no object then feast yourself on Venice’s best sea-food dishes here. Fiore Trattoria, Calle delle Botteghe, San Marco, Venice is a lot more middle o’ the road price-wise, but still serves excellent sea-food. Al Nono Risorto, Sottoportico di Siora Bettina, Santa Croce, Venice serves excellent pizza if you’re finding the sea-food too much. 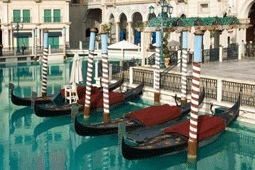 The Venitian equivalent of a wine-bar is the bacaro but you can also stop into a pub and get your favourite tipple. Harry’s Bar, Calle Vallaresso, San Marco. When all is said and done, there really is only one place to have a drink in Venice, and that’s Harry’s Bar. Made famous by far too many people, Harry’s Bar may be a bit pricey, but the bar you’re drinking at was lent on by Ernest Hemmingway, Orson Welles, Lord Byron, Marcel Proust and many more thinkers, drinkers poets and playwrights. Caffe Florian in St. Mark’s Square is another infamous drinking spot. Orange, Campo Santa Margherita, Dorsoduro, Venice. The interior is, as the name suggests, orange – but the menu is as good as the drink on offer. All the top shops and main name brands are there - while the city is visited for it's history and atmosphere, there is plenty of shopping to do. 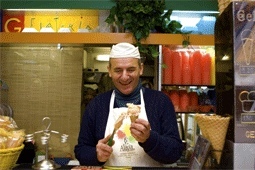 The markets in Rialto are well worth the visit. Bridge.....Rialto Bridge….no, the Bridge of Sighs…..no, Rialto Bridge….oh, no the Bridge of Sighs. Basillica.....Basillica de San Marco, not only for it’s art but the view from the bell tower is amazing. 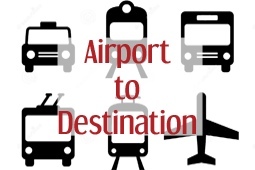 Marco Polo airport is a few miles from Venice, on the edge of the lagoon. Buses depart every 30 minutes for about €4 to Piazzale Roma at the top of the Grand Canal in Venice from where you can get a waterbus service to the San Marco area. Alternatively, take the motorlaunch service for about €9 (not the water taxi) from the airport which arrives at a water terminal near St. Mark's Square.